Here's a reminder, Fiat North America is displaying a couple of Fiat 500s at the Fiat Lancia Unlimited car clubs national convention in Asheville, NC. You can read more about it here and here. The convention, called the "Fiat Freak Out", starts July 8th and runs until the the 11th. 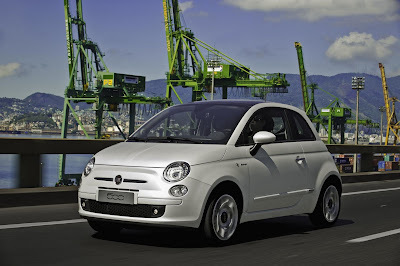 The Fiat 500 display is scheduled for Friday, the 9th and Saturday the 10th. Check with Fiat Lancia Unlimited for details (FLU website here). Don't miss this chance to see the 500! I'll be there taking photos and enjoying a great time with fellow car enthusiasts. Not only were the twin 500's in Asheville this weekend, but to the delight of many, so were the beautiful Fiat twins. Like every year, Freakout was an outstanding weekend of driving, car shows and gathering of friends, but this year was especially exciting with Fiat joining the fun. It was a great time. I can't wait 'till next year and see the new 500 class!